Relationships among the major ant lineages are still unclear. The unresolved phylogeny given above is based on the subfamily-level classification of Bolton (2003), with relationships of the dorylomorph subfamilies from Brady (2003), and with Apomyrminae sunk into Amblyoponinae as in Saux et al. (2004). Agosti, D., D. Grimaldi, and J. M. Carpenter. 1997. Oldest known ant fossils discovered. Nature 391: 447. Baroni Urbani, C. 2000. Rediscovery of the Baltic amber ant genus Prionomyrmex (Hymenoptera, Formicidae) and its taxonomic consequences. Eclogae Geologicae Helvetiae 93: 471-480. Baroni Urbani, C., B. Bolton and P. S. Ward. 1992. The internal phylogeny of ants (Hymenoptera: Formicidae). Systematic Entomology 17: 301-329. Brown, W. L., Jr. 1954. Remarks on the internal phylogeny and subfamily classification of the family Formicidae. Insectes Sociaux 1:21-31. Crozier, R. H., L. S. Jermiin, and M. Chiotis. 1997. Molecular evidence for a Jurassic origin of ants. Naturwissenschaften 84: 22-23. Grimaldi, D. and D. Agosti. 2000. A formicine in New Jersey Cretaceous amber (Hymenoptera: Formicidae) and early evolution of the ants. PNAS 97: 13678-13683. Grimaldi, D., D. Agosti, and J. M. Carpenter. 1997. New and rediscovered primitive ants (Hymenoptera: Formicidae) in Cretaceous amber from New Jersey, and their phylogenetic relationships. American Museum Novitates 3208: 1-43. Rust, J. and N. M. Andersen. 1999. Giant ants from the Paleogene of Denmark with a discussion of the fossil history and early evolution of ants (Hymenoptera: Formicidae). Zoological Journal of the Linnean Society 125: 331-348. Saux, C., B. L. Fisher, and G. S. Spicer. 2004. Dracula ant phylogeny as inferred by nuclear 28S rDNA sequences and implications for ant systematics (Hymenoptera: Formicidae: Amblyoponinae). Molecular Phylogenetics and Evolution 33: 457-468. Schultz, T. R. 2000. In search of ant ancestors. PNAS 97(26): 14028-14029. Shattuck, S. O. 1992. 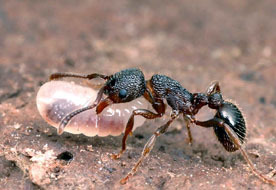 Higher classification of the ant subfamilies Aneuretinae, Dolichoderinae and Formicinae (Hymenoptera: Formicidae). Systematic Entomology 17: 199-206. Ward, P. S. 1994. Adetomyrma, an enigmatic new ant genus from Madagascar (Hymenoptera: Formicidae), and its implications for ant phylogeny. Systematic Entomology 19: 159-175. Ward, P. S., B. B. Bolton, S. O. Shattuck, and W. L. Brown, Jr. 1996. 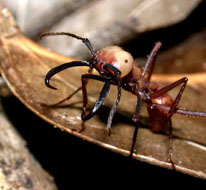 A bibliography of ant systematics. University of California Publications in Entomology 116:1-417. Wilson, E. O. 1987. The earliest known ants: an analysis of the Cretaceous species and an inference concerning their social organization. Paleobiology 13(1): 44-53. Wilson, E. O., F. M. Carpenter, and W. L. Brown, Jr. 1967. The first Mesozoic ants. Science 157: 1038-1040. Antbase. American Museum of Natural History and Ohio State University. AntWeb. Tools for exploring the diversity and identification of ants. California Academy of Sciences. Non-Native Ants. Names and geographic distribution data of the known non-native ant species of the world. Australian Ants Online. S. O. Shattuck & N. J. Barnett. 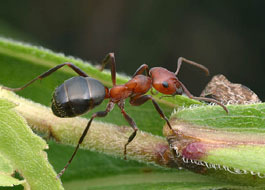 Smithsonian Ant Database. Maintained by Ted Schultz. The Ants of North America. William and Emma Mackay. The University of Texas, El Paso. Ants of Costa Rica. John T. Longino, Evergreen State College. The Ants of West Africa. Brian Taylor. Ants of Cowling Arboretum and McKnight Prairie. A Carleton College student project. AntColony.org. Ant Colony Developers Association. Page: Tree of Life Formicidae. Ants. The TEXT of this page is licensed under the Creative Commons Attribution-NonCommercial License - Version 3.0. Note that images and other media featured on this page are each governed by their own license, and they may or may not be available for reuse. Click on an image or a media link to access the media data window, which provides the relevant licensing information. For the general terms and conditions of ToL material reuse and redistribution, please see the Tree of Life Copyright Policies.